XebraTax offers every new client a “90 Day Moneyback Guarantee”? That is correct! We want you as a client to be very happy with the ‘Scope of Service’ we are providing you. Our service will give you ‘total peace of mind’, save you time and save you money and we achieve all this through the use of technology and a great culture amongst our XebraTax Team. So, after the first 90 Days, we want you to be totally satisfied with our service. 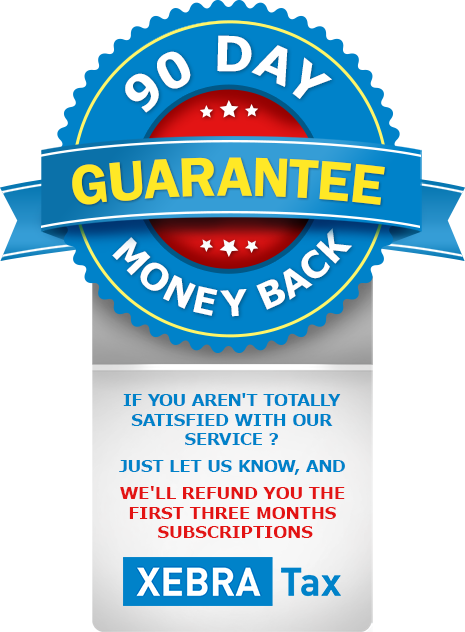 If for you are not and you want to leave us, just let us know and we will refund you the first three months of your monthly subscription fee – no questions asked! That is XebraTax’s “90 Day Moneyback Guarantee!